The Vancouver Canucks and Alex Edler have a big decision to make. In the final year of a $5 million contract, the 32-year-old defenceman will become an unrestricted free agent on July 1 if left unsigned. Just how GM Jim Benning handles the situation will be telling. If he believes the Canucks can be a contender in the next three years, then it probably makes sense to re-sign Edler. If they’re further away, then the team should do its best to trade him. Few players have played more games in a Canucks uniform than Edler, who after debuting for the team in 2006, has played 788 games with the franchise. That ranks him seventh all-time in Canucks history, and first among defencemen. Despite the fact that he doesn’t command the spotlight, Edler has been one of the most important players to the Canucks during his 13 years in Vancouver. He’s a workhorse again this season, just as he has been since 2010-11, averaging over 23 minutes of ice time every year since then. So if there’s a player who the organization should show loyalty and respect to, it’s Edler. But this is also a business. Benning can’t afford a repeat of the Dan Hamhuis situation in 2016. That year, the Canucks were left with nothing after rejecting sub-optimal offers at the trade deadline. Hamhuis, who was a year older than Edler is now, had a no-trade clause and left the Canucks with limited options. They got nothing for him at the deadline, then watched him leave in the summer as a UFA. Ultimately, Edler holds the cards because he too has a no-trade clause in his contract. And it doesn’t sound like he wants to play anywhere else. The Canucks didn’t appear to handle the Hamhuis situation well, though they have been able to convince other players that liked being in Vancouver to move on. Alex Burrows waived his no-trade clause in 2017, while Kevin Bieksa agreed to leave town in 2015. The Canucks could re-sign Edler or ask him to waive his no-trade clause in an attempt to recoup draft picks and/or prospects before the February 25 trade deadline. If management feels like moving him is in the best interest of the team – and that’s debatable – then they need to do what they can to convince him to agree to a trade, just as they did with Burrows and Bieksa. Agreeing to waive a no-trade clause is not without risk, which is something Edler will need to consider. While moving on to a contender at the trade deadline would give him a shot at winning a Stanley Cup, it also means risking money in free agency. Edler is in a familiar situation in Vancouver. He plays big minutes, runs the first unit power play, and is enjoying one of the best seasons of his career statistically, with 19 points (4-15-19) in 30 games. If he leaves to a contender, his role will almost surely be diminished, and perhaps his value takes a dip because of it. After years of dismantling, at some point, the Canucks need to start building towards the playoffs. The Canucks appear set to miss the postseason for a fourth consecutive year, with no guarantees that they’ll get in next season either. Their future is looking brighter though, with young stars like Elias Pettersson, Brock Boeser, and Bo Horvat now the offensive leaders of the team. But on defence, the team is still thin. Quinn Hughes will be in Vancouver soon, but expecting him to instantly become a top pairing defenceman would be unrealistic. Their other top prospect on defence, Olli Juolevi, may be a few years away from becoming a top-four defenceman, and even that’s not guaranteed. With apologies to Jalen Chatfield, Guillaume Brisebois, and Evan McEneny, there aren’t any other blueliners to get excited about in Utica. Jett Woo is in the pipeline, as are Toni Utunen and Jack Rathbone. But each one of them are likely years away from being in a position to contribute meaningful minutes in Vancouver. Top pairing defencemen don’t grow on trees, and trading Edler probably takes away any opportunity for the team to make the playoffs next year, and maybe the season after as well. The Canucks could trade Edler and try to replace him in free agency, but that’s not without risk either. It’s also not likely to come with a hometown discount that Edler may be willing to give. Nick Kypreos suggests on @Sportsnet650 a 3 year deal worth $15-17M might be something Edler would take to remain with the Canucks. Provided the term doesn’t get out of control on a contract extension (ie. less than four years), then it makes sense to keep Edler on the team to help insulate young players until they’re ready to take over as leaders of the defence. The organization is at a different point than they were when Hamhuis left town. Pettersson has changed the outlook of the team dramatically, so it’s time to build with a young core. They’ll need some veterans around too, preferably ones that can play. 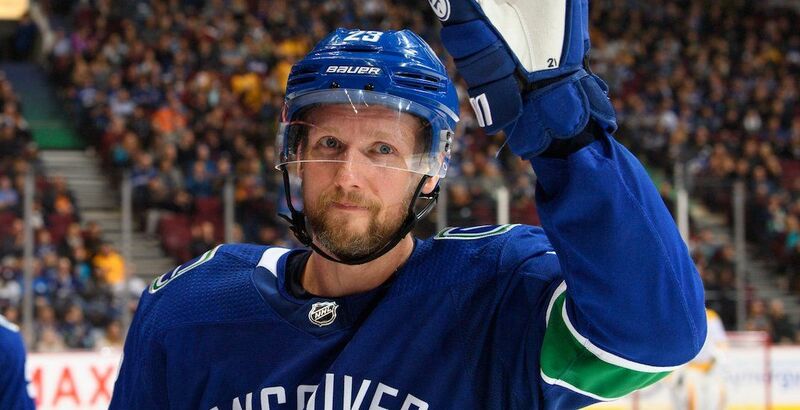 Unless he follows Sami Salo’s career trajectory, remaining incredibly dependable until the age of 40, Edler is a diminishing asset. The Canucks need to figure out when they think they can contend for a Stanley Cup again and begin collecting players that can help them in that window. Father time may not allow Edler to be a top-four defenceman in his late 30s, which is something Benning needs to consider. There are no shortage of teams looking to add defencemen at the trade deadline, and there may be some that believe that adding Edler to a second pairing could put them over the top. If that’s the case, Vancouver would likely fetch at least first-round pick in return for him, which has the potential of putting the Canucks over the top when they’re competing for the Cup in a few years. Trade him, keep him… Why can’t we have it all? The dream scenario, let’s call it the Keith Tkachuk plan, is to trade Edler at the deadline and re-sign him on July 1. Of course, it’s against the rules for the Canucks and Edler to officially agree to such a deal. But perhaps each party could come to a mutual unspoken understanding? If Benning could pull off dealing Edler and sign him in the summer? Well, that would be a stroke of genius because they need both him, as well as the asset he could fetch in a trade. Do that, and Edler gets his name in the Ring of Honour, no questions asked.